Security forces ride a motorcycle up a pavement during violent clashes with protesters. Thousands of people went out to the streets to protest against Maduro’s government. Photo: Rayner Pena/DPA/PA Images. All rights reserved. In the last few hours, over the past weeks, Venezuela has been living in extreme tension. Venezuela is facing what is known in chess as a zugzwang: it must make a move while knowing that all the moves it can make are no good. Venezuela lives in confusion. It has two presidents who each interpret the constitution in their own way: one was elected through an electronic vote developed by a contractor company that claimed that its machines had been “manipulated”, and the other proclaimed by the legislative chamber controlled by the opposition majority that has been declared in “contempt”. The premise of an armed conflict is gaining ground in the media and press conferences; amongst troops mobilized in Colombia and the “people’s militias”. References to Iraq, Afghanistan, Syria and Vietnam are creating a context that is bound to end up in increased violence and an even larger institutional and political crisis. The situation in Venezuela should be viewed with despair rather than cynicism. It is a known fact that many Latin American states - Argentina, Chile, Colombia, Paraguay, Ecuador, Peru, Guatemala - have promptly conformed to Washington’s strategy and recognised Guaidó in almost an impulsive way while distancing themselves from the political and geo-political implications of their decision. Minding other interests, the European parliament, following Spain, has joined in as well. Bolivia and El Salvador have acted in a similar way but taking the opposite direction and condemned Guaidó’s ‘illigetimate’ assumption. Mexico and Uruguay have decided to take yet another path, and are calling for an internationally-brokered negotiation. In Latin America, ‘Venezuela’ has become a domestic issue: it is a concept used in most countries to suit a variety of political disputes. This attitude, which determines the perception of the Venezuelan question according to one’s political stand, has a profound degrading effect on public discussion - it ignores the peculiarities of the history of Venezuela, its party alliances, its social structure, the habits and practices of the elite that has been in power for nearly the last two decades and those of the elite that was in power before and is now in the opposition. This nostalgic Left with its rustic liturgy breathes life into fascism. More than ever, we need to create a Left with a new narrative, one that addresses social majorities. Maduro’s government is a failure. At no point has he been able to regulate the production and exchange relations in Venezuela. ‘Revolution’ under him has been administered by the military and financed by the Chinese and Russian governments. His currency is like dust in the wind and the sheer size of the current crisis has reached historic proportions. Adscribing Maduro to the ‘Left’ or to ‘21st century Socialism’ is to cast doubts on both the Left and the 21st century. 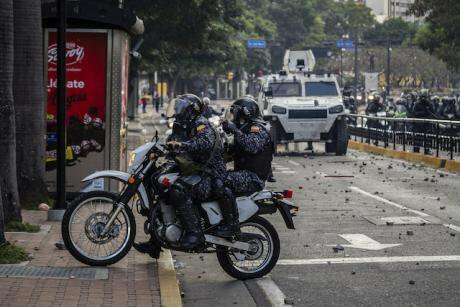 If being in the opposition in Venezuela means that your life is threatened and opposition demonstrations have been heavily repressed for many years, it is unacceptable to say that there is democratic freedom in Venezuela. The attitude of the nostalgic Left, so reluctant to call things by their name, is painfully embarrassing. The Left that says “you are mistaken” to the millions of people who have decided to flee their country (as if exile is something one chooses to do) fails to understand what is going on. The Left that pays no attention to the desperately high homicide rates is dodging responsibility. The Left that, before a coup, does not see the difference between being Salvador Allende and Nicolás Maduro, is denying its own history. This nostalgic Left with its rustic liturgy breathes life into fascism. Today, Venezuela’s ghost is fueling the Latin American right and far right that are currently winning across the region. Therefore, more than ever, we need to create a Left with a new narrative, one that addresses social majorities. The weapons of mediation and political negotiation must bring sovereignty back to where it belongs: to the Venezuelan people, deciding through fair elections. Venezuela is a country mired in crisis, divided and polarised, where encouraging a scenario of confrontation will only bring more misery. No democrat can justify a military coup or a war. It is up to the Venezuelan men and women, the people who are trapped between different doctrines and interests, the people who can only have a meal a day, who are asking for medical drugs that their lives depend on, who spend many sleepless hours shaken by the repression and death around them, who listen to the hushed voices of their frightened family members - these people, who understand what being alienated and reduced to a minimum feels like, are the ones we should be listening to.